When it comes to long distance roads and highways, the State of Sao Paulo has made a decision and adhered to it (not many Brazilian States have followed the same philosophy): roads must allow users to drive fast and safe, and users must pay for it. Most roads were chartered to private management, which collect tolls and are obliged to maintain a minimum quality level. In a country like Brazil, where transportation means such as railways and waterways never developed fully (and Sao Paulo holds much responsibility for that, as the State was home to all pioneer car makers in Brazil - to whom roads were an essential factor of progress), the main means of moving people and cargo around are the highways. The State of Sao Paulo have the best highways in Brasil. The map below shows the most important roads in the State of Sao Paulo. Guia Quatro Rodas (Four Wheels Guide), the most reknowned Brazilian magazine about cars, compiled a list with the best and worst roads in Brazil. According to the magazine, out of the ten best roads in Brazil, eight are situated in Sao Paulo. To evaluate quality roads, the criteria are: single or double lane each way (many important roads in Brazil are still single laned); quality of pavement (certain federal highways have more holes than a Swiss cheese); signalization; availability of emergency phone boots, tows and ambulances. The quality of highways in Sao Paulo is very much due to the fact that they have a private managemente (rather than a State management). Most roads have tolls (something which are not usual in Brazil), which many consider overly priced. Toll prices are determined by the contract signed between the State and the enterprise to which the road was chartered; for example, take a look at Dutra and Ecovia, the two busiest roads in Brazil. 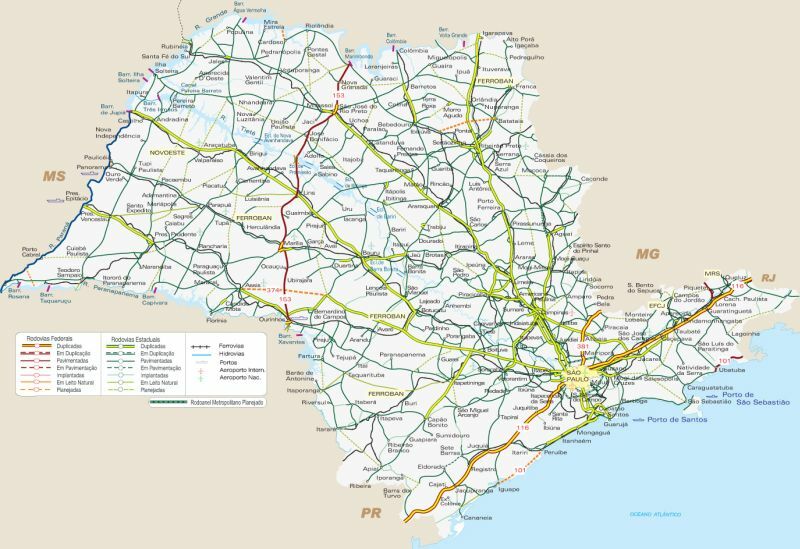 » State roads of Sao Paulo. » Federal roads in Sao Paulo - click on each road to check out current status.